More than 5 million of Ethiopia’s 42 million children are orphans. Many have been abandoned by parents too poor to care for them. About a fifth have lost a parent to AIDS. To spare young orphans from despair, adults will often lie: Your father had the chance to work abroad. As an elementary-school teacher in the capital, Addis Ababa, where she grew up, Bruktawit Tigabu saw her students overwhelmed and confused by all this loss. She wanted to break the culture of silence, discuss death, and help youngsters grieve. She also wanted to address another enormous problem: Nearly 60% of Ethiopian children grow up illiterate. Tigabu left her school in 2004 to create a bigger–and, she hoped, more meaningful–classroom. On television. With Shane Etzenhouser, an American software engineer she married that year, she started the for-profit social enterprise Whiz Kids Workshop, to make educational kids programs. “We’re giving children the tools to help them think better,” says Tigabu, 30, a self-taught filmmaker. 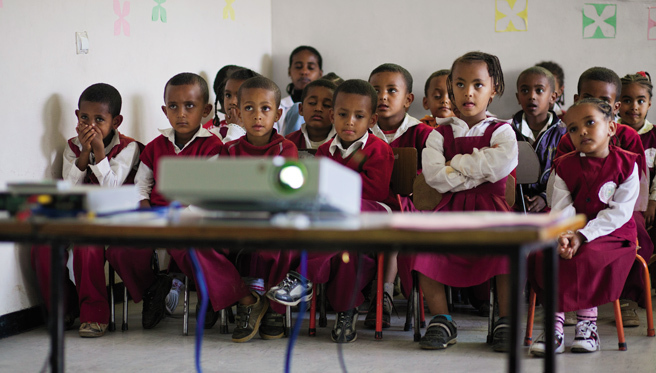 Ethiopia doesn’t have public preschool or kindergarten, so the show has become many kids’ first teacher. Her most popular series, Tsehai Loves Learning, runs twice a week on Ethiopian national TV and targets early-childhood education. Each 10- to 20-minute episode stars a curious young giraffe sock puppet that would fit right in on Sesame Street, except that Tsehai is singing in Amharic, learning its complex alphabet, and wrestling with grown-up issues. “If it’s a topic that children are struggling with, we need to struggle with it, too, even if it’s hard,” Etzenhouser says. Episodes have addressed such topics as AIDS, malaria, and the child-slave trade in Africa. Tigabu makes each issue resonant for children, showing, for example, Tsehai comforting a turtle who’s sad over the death of his mother. Whiz Kids has a staff of nine, but Tigabu sews the puppets, outlines the story, reads Tsehai’s part, and supervises editing–when she’s not securing grants from UNESCO and others to meet her meager $100,000 annual budget. Prior to shooting, she takes storyboards of an episode into schools to show young students. “I observe their attention,” she says, “and if they’re watching the interaction we want them to.” If the storyboards work, the live action will too. In addition to national TV, her shows are shown inside schools, and at times she’ll travel to rural communities without electricity and conduct screenings from a TV powered off a car battery. Following the success of Tsehai, which has won accolades from Ethiopia’s Ministry of Education and awards from international education conferences, she has created series for older children. On Little Investigators, high-school students explore science issues, such as the impact of deforestation in Ethiopia. Involve Me features interviews and short videos by kids whom Tigabu has trained in filmmaking. “I fled to Addis to escape from early marriage,” a girl named Yemeserach says in one episode. She’s 14 and living in a shelter for abused children, having left her family and her village. “There is a heavy burden on girls,” Yemeserach says. It’s one that Tigabu is working hard to ease.